After a small hiccup in our release schedule, we are back on track to tell you about two different computers, one that will make a great prop in a 1970’s style Sci-Fi movie remake, and another that would do well to hold open that door that keeps swinging shut on its own. 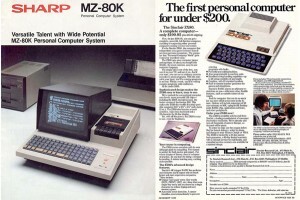 We are talking about the Sharp MZ-80K and Sinclair ZX80, respectively. These are two international systems, and our first featured Japanese computer. We’re actually skipping another significant computer system that was released before the ZX80, but our next show will be fully dedicated to that American computer series released in 1979, the Atari 400 & 800. You can download the Episode 10 audio here. Podcast Episode 10: Sharp MZ-80K and Sinclair ZX80 was posted on Friday, January 30th, 2015 at 1:30 pm. This post is tagged and is filed under . You can follow the replies through the comments feed. Pings are closed but you can Leave a comment!